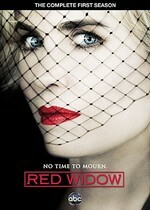 Red Widow: Mystery and Suspense on Television. Radhas Mitchell stars as Marta Walraven, a stay-at-home mom in tony Marin County, just north of San Francisco, a woman devoted to her three children and her husband. Behind this perfect façade, however, is a more complicated story: Evan, Marta's husband, supports the family by exporting marijuana. Marta is familiar with the world of organized crime: her father, Andrei Petrov, and his loyal bodyguard, Luther, are Bratva — Russian gangsters — in San Francisco. It's a world from which she and her sister Kat always wanted to escape, though they never quite did. But when Evan is brutally murdered in their driveway, everything changes. Marta's first concern is to protect her children — and yet when FBI Agent James Ramos promises Marta justice in exchange for her cooperation, she cannot go against the Bratva code. She refuses his help. Slowly, the truth about her husband's murder begins to emerge: Evan's business partners — Marta's scheming brother, Irwin Petrov, and their best friend, the hapless Mike Tomlin — were involved in the theft of millions of dollars of cocaine from the formidable international crime boss, Nicholae Schiller. Evan paid with his life, but as far as Schiller is concerned, his debt is not clear. It falls to Marta, as Evan's widow, to navigate the criminal underworld in order to repay this debt — in whatever way Schiller sees fit. As she hunts for the truth about her husband's death and struggles to keep her children safe, she'll rely on her resourcefulness, determination and her Bratva DNA like never before. But just how far is Marta willing to go in order to beat her adversaries at their own deadly game? This ABC crime drama, which premiered in Spring 2013, is based on the Dutch series Penoza It was not renewed for a second season.